Background: An earthquake and tsunami hit the east coast of Japan on March 11, 2011. Nurses were actively involved in the health response to this disaster and, subsequently, many authors have reported on the role nurses played in these efforts in Japanese nursing professional journals. 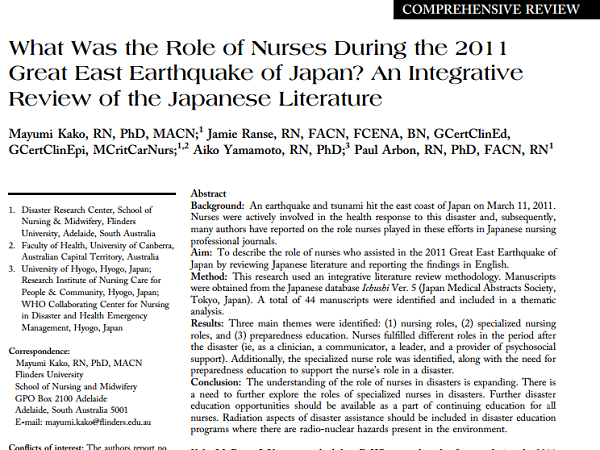 Aim: To describe the role of nurses who assisted in the 2011 Great East Earthquake of Japan by reviewing Japanese literature and reporting the ﬁndings in English. Method: This research used an integrative literature review methodology. Manuscripts were obtained from the Japanese database Ichushi Ver. 5 (Japan Medical Abstracts Society, Tokyo, Japan). A total of 44 manuscripts were identiﬁed and included in a thematic analysis. Results: Three main themes were identiﬁed: (1) nursing roles, (2) specialized nursing roles, and (3) preparedness education. Nurses fulﬁlled different roles in the period after the disaster (ie, as a clinician, a communicator, a leader, and a provider of psychosocial support). Additionally, the specialized nurse role was identiﬁed, along with the need for preparedness education to support the nurse’s role in a disaster.